Crews work to tear down the old medical and surgical building on the Gallipolis Developmental Center property, Thursday. 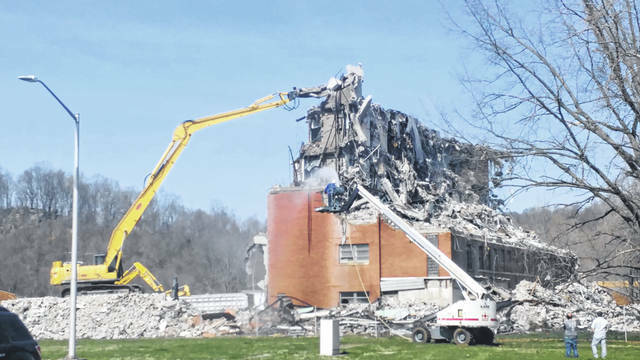 GALLIPOLIS — The Ohio Department of Developmental Disabilities and the Gallipolis Developmental Center recently were in the process of demolishing a five-story building on its campus due to reported safety concerns with structural integrity. “We’re bringing it down for a safety issue,” said Ohio Department of Developmental Disabilities Communications Representative Laura Tucker. The property gained the name of the Gallipolis Developmental Center in 1979, said the superintendent. Reportedly, discussion surrounding the building’s demolition had existed for some time. “Our plans are to beautify the property, plant some grass seed and flowers,” said Tucker.